The effect of sugar and poor diet on children’s teeth is well-documented, resulting in more children being admitted to hospital for tooth decay than for any other medical condition. Dental students from University of Plymouth's Peninsula Schools of Medicine and Dentistry are working with nurses from the Family Nurse Partnership and the families they support, to develop ways of improving knowledge and emphasising the importance of diet for pregnant mothers, their babies and weaning. The project will especially focus on sugar and ways to reduce its consumption. The Family Nurse Partnership Programme is available on a voluntary basis to women under the age of 19 who are expecting their first baby. Based on regular home visits, family nurses offer support during pregnancy and until the child becomes two years of age. The family nurse replaces the role of the health visitor and works with young mothers on personal health, environmental health, life course development, the maternal role, family and friends, and health and human services. The objective of the programme is to improve the experience of pregnancy, child health and development, and to help young women with the role of mother. 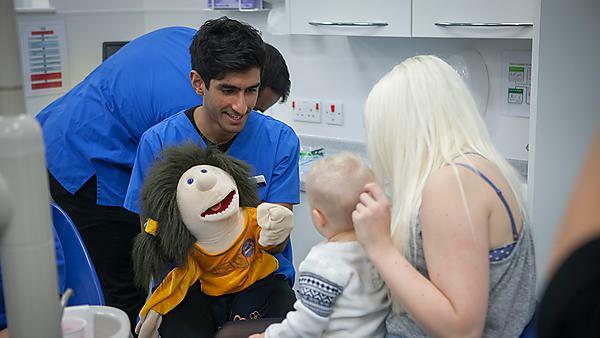 The project is part of the Inter Professional Engagement programme which sees dental students undertake a number of projects in the community designed to raise oral health awareness and to improve access to dental care. The programme is delivered by the Community Engagement Team at the Peninsula Dental Social Enterprise. The students will investigate the evidence around sugar consumption to ensure that the advice given is beneficial for mothers and their babies. They have already organised a visit to the Derriford Dental Education Facility (where dental students treat NHS patients under the supervision of qualified dental professionals) to talk about access to dental care. The visit also included information about sugar. The students are also developing a series of flash cards to help drive the sugar message home. They are also, in conjunction with a breast feeding nurse, providing information and advice during a Health Visiting Baby Clinic for young mothers, to emphasise the importance of good nutrition and healthy eating and how to reduce sugar consumption, with a special focus in weaning.